This week’s theme includes cleaning and organizational products, pet items, and lots of food for back-to-school breakfasts and lunch boxes. Bissell® SpotLifter® PowerBrush, $49.99. The reviews aren’t stellar, and the price is similar to other outlets, but it’s probably still an improvement over Aldi’s disappointing steam cleaner. Easy Home Stick Vacuum, $14.99. Features detachable base for handheld use. Easy Home 3-Pack Indoor/ Outdoor Brooms with Dustpan Comb, $9.99. Easy Home Wet or Dry Cloth Refills, $4.99. Dry Cloth-32 pk. Wet Cloth-24 pk. 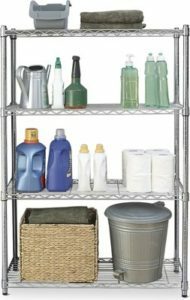 Easy Home 4-Tier Chrome Shelving, $29.99. Measures 36″ x 14″ x 54″ with 350-lb. weight capacity per shelf, 1400 lb. total. Features adjustable shelves. Cat Scratching Post, $12.99. Assorted varieties. Pet Mat, $1.99. Fade and skid resistant. Assorted varieties. Chew Shoe 2-Pack Dog Toy Set, $9.99. Available in small and large. Assorted styles. Elevated Pet Feeder, $9.99. Rust-free stainless steel. Holds up to 4 cups of dry food. 25-lb. Pet Food Container, $12.99. Includes scoop, wheels, and airtight seal. Indoor/Outdoor Bed, $16.99. Assorted varieties. Machine washable. Portable Travel Pet Playpen, $19.99. Assorted varieties. Pure Being Grain Free Crunchy PB & Molasses Dog Biscuits, $2.99 for 24 oz. Audubon Park Wild Bird Food, $6.99 for 20 lbs. Lunch Buddies PB & J Delights, $5.49 for 20 oz. YoCrunch Oreo and M&M Yogurt Parfait Multipack, $4.99 for 48 oz. Nabisco Snak-Saks, $1.95 for 8 oz. Assorted varieties. SimplyNature Fruit Squeezies Variety Pack, $4.89 for 38.4 oz. SimplyNature Organic White Cheddar Puffs Snack Packs, $3.99 for 6 oz. USDA organic. Savoritz Baked Cheddar Penguin Crackers Portion Pack, $3.29 for 9 oz. Jif To Go Creamy Peanut Butter, $2.49 for 12 oz. Pepperidge Farm Flavor Blasted Cheddar Goldfish, $1.78 for 6.6 oz. Benton’s Mini Bear Grahams, $3.99 for 12 oz. Apple Cinnamon or Strawberry Banana. Happy Farms Preferred Fresh Mozzarella Snack Sticks, $3.89 for 8 oz. Kellogg’s Special K Cereal, $2.89. Assorted varieties in 12.5-13.1 oz. sizes. Village Bakery Mini Muffins, $2.99 for 12 oz. Banana Chocolate Chip or Cinnamon Roll. SimplyNature Organic Vanilla Granola, $2.79 for 11.5 oz. USDA organic. Ancient Grain or Almond Flax. Season’s Choice Pineapple Chunks or Island Medley, $4.99 for 32 oz. Sold frozen. Bacon Cheddar Seasoned Beef Patties, $5.29 for a 1.33-lb. package. USDA Choice Salt & Pepper or Texas BBQ Beef Brisket, $4.99 per lb. Audubon Park, Benton's, Bissell, Easy Home, Happy Farms, Jif, Kellogg's, Lunch Buddies, Nabisco, Pepperidge Farm, Pure Being, Savoritz, Season's Choice, Simply Nature, Village Bakery, YoCrunch. Bookmark.